Star with two clusters, and the Purple Heart. Though Brig. General Travis was often very casual in social settings, he was extremely professional when it came to his military duties. One former crew chief distinctly remembers how General Travis would personally enforce safety regulations by stalking the flight line and maintenance areas with a measuring tape in his pocket to ensure that no one smoked within 50 feet of an airplane. This pursuit of military perfection was not always well received. General Travis had such a strong personality that people frequently reacted to him with strong emotions that remained unchanged by his death. He was in turn, loved, respected, hated, and feared. After Brig. 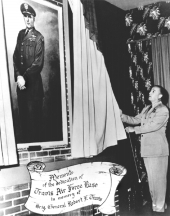 General Travis's death many supporters successfully pressured the Air Force to rename the base in his honor, a full-length painting of him was hung in the officer's club. One night this painting was vandalized. The damage was so severe that the lower half of the painting had to be discarded when the painting was restored. After the restored painting was re-hung it mysteriously disappeared only to be found hidden within a dark storeroom. Brigadier General Robert F. Travis’ untimely death in a tragic crash of a B-29 on August 5, 1950, cut short a brilliant military career that had begun with his graduation from West Point in June 1928. An accomplished military aviation engineer and command pilot. 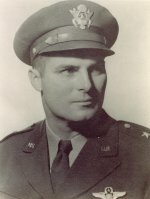 Travis saw action in World War II as commander of the 41st Combat Wing in England. He personally led his men in 35 combat missions over Nazi-occupied Europe. The decorations that he received included the Distinguished Flying Cross with three oak leaf clusters, the Air Medal with three clusters, the French Croix de Guerre with palm, the Legion d’Honneur, and the Purple Heart. Scion of a prominent military family (his father was an Army general), Travis was born in Georgian 1904. He assumed his first command at Hickam Field, Honolulu in June 1939 as commander ofthe72M Bombardment Squadron. He received his brigadier general’s star in September 1944 after assuming command of the 41st Combat Wing in Europe. He was then reassigned to Hickam, this time as Commanding General, Pacific Air Command. His brilliant wartime bombing record and rapid rise in rank made him an obvious choice to supervise the Strategic Air Command’s development of Fairfield-Suisun AFB in 1949. Attaining command of both SAC wings at the base granted him an additional distinction during his tenure there. Brigadier General Travis’ popularity and the effect of his death in such a terrible accident led local civilian leaders and base officials alike to propose renaming the base in his honor. Their proposal was favorably received in Washington and on October 20, 1950, Fairfield-Suisun AFB became Travis AFB. California Governor Earl Warren presided over the formal dedication ceremonies, which many dignitaries and members of the Travis family attended, on April 20, 1951. Here's the story of Virginia Esh who witnessed the crash of General Travis’ B-29 in August 1950. I met Virginia while selling air show coins at the BX in June, 2000. She saw the General Travis face on a coin and said he was a very nice man. I asked her some questions and found out she knew him and was on the base at the time of the crash. I later called her to get her story. Virginia moved to this area in 1943 when her parents relocated. She went to Armijo High School and then worked for the telephone company doing the billing for the people who lived at Fairfield-Suisun Airfield. She met her future husband Bobby Chase through her telephone dealings. They were married and lived in base housing, which at that time was located directly beneath the eucalyptus trees in today's Eucalyptus Park. Her husband ran Base Operations at the time, and the base was busy with folks returning from the Pacific after World War II ended. On the day of the crash, she was at home having a late dinner with her husband. He got a phone call that there were some B-29s preparing to take off, and he left to go launch them. Virginia was recovering from polio at the time and was in a back brace. The planes took off, and Bobby returned home. A little while later, Virginia heard aircraft engines and mentioned it to Bobby. He said all the planes had left, but then a very low flying aircraft flew over their house. It was a very cold and foggy day in August, and she said she thought the plane was trying to find the runway to land. Her husband grabbed her and they both hit the floor. The second time around, the plane struck the tops of the eucalyptus trees and crashed just south of today's Family Camp Ground. There were some folks at the bakery not too far away, and they were the ones who ran over to help, pulling people out of the plane. Because of the fire, oxygen bottles were shooting out of the aircraft and flying in the air, striking the roof of a nearby house. It was some time later that General Travis died from his injuries. She remembers General Travis well. He and his wife were good friends of theirs. In fact, General Travis loved to build model airplanes and used the Chase's spare bedroom as his workshop. She said he was a sweet man, and the base was very sad when he died. At the time of the crash, the people at the base were trying to think of a new name for the base because it was hard to say Fairfield-Suisun. The city council members didn't like that idea, but when General Travis was killed, it seemed a perfect way to honor him and find an easier name. This helps explain why the renaming went so quickly. Ironically, Virginia’s current house in Vacaville was directly under the flight path of a C-5 when it made a flyby for a special occasion over the baseball stadium in Vacaville. When she heard and saw the plane, which was flying quite low, it immediately brought back memories of the crash of the B-29. However, with her vast experience with aircraft during her husband's Air Force career, she soon realized that the plane was merely flying low, so she was not among those who called in to report a crashing C-5! 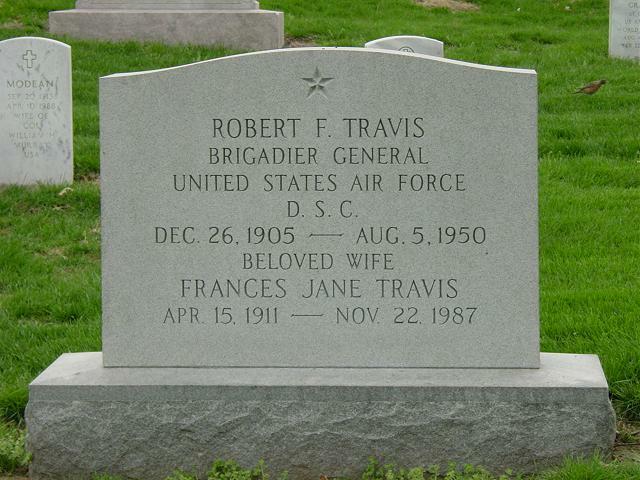 ARLINGTON, Virginia, August 14, 1950 – Brigadier General Robert F. Travis, who died eight days ago in the crash of a B-29 Superfort in California, was buried today with full military honors at Arlington National Cemetery. An honor guard and an Army band led some 200 troops escorting the coffin from nearby Fort Myer Chapel to the gravesite among American’s military war dead. 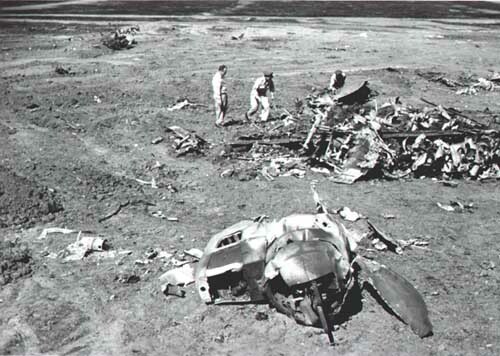 General Travis was commander of the Ninth Strategic Reconnaissance Wing at the Fairfield-Suisun Base, where the crash occurred. He was born in Savannah, Georgia forty-five years ago.